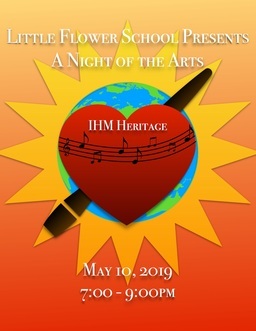 This year our Spring Concert will be on Friday, May 10th and theme is "IHM Heritage". The concert will tell the story of the foundation of the IHM Sisters and the Art Show will feature student works inspired by this story. What a wonderful way to celebrate our students AND our Sisters! Please contact the school or complete an online application through our Admissions page. This year as we celebrated the Solemnity of the Immaculate Conception – the feast day of our IHM Sisters - Monsignor Vaghi blessed our new stained glass windows. To commemorate these beautiful additions to our school building, each student received a Christmas ornament with a picture the IHM center window. This window has the beautiful globe logo which celebrates the mission and ministry of the Sisters, Servants of the Immaculate Heart of Mary around the world. If you haven't seen the windows yet, please do come by to see them! Our Buddy Groups worked on a special activity to promote spreading kindness. 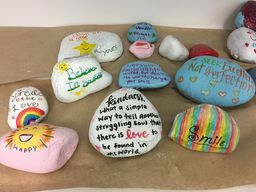 It was a project modeled after The Kindness Rocks Project. We decorated painted rocks with kind words to place around our community. The students brought their rock home and were encouraged to choose a spot to place it. Have you seen any around Bethesda? U.S. Secretary of Education Betsy DeVos announced the 2017 cohort of National Blue Ribbon Schools. 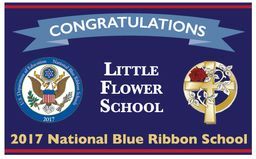 Little Flower School is one of the 50 non-public schools in the country receiving this special honor. Please join us in celebrating this wonderful honor designating our school as a distinguished exemplary high performing school! 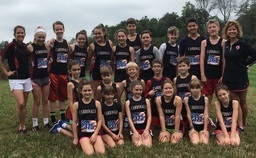 The National Blue Ribbon Schools Program recognizes public and private elementary, middle, and high schools based on their overall academic excellence. Every year the U. S. Department of Education seeks out and celebrates great American schools, schools demonstrating that all students can achieve to high levels. The National Blue Ribbon School award affirms the hard work of students, educators, families, and communities in creating safe and welcoming schools where students master challenging content. The National Blue Ribbon School logo is a widely recognized symbol of exemplary teaching and learning.